Yes, a fable, and one to warm the heart, but, as the author’s daughter Aline reveals in her afterword, one that also gained life of its own. Apparently, readers of this story all over the world have believed it to the extent that wooded areas in countries from Finland to New Zealand have been attributed to a lone shepherd with a quiet, but steadfast, ambition.Which to me reveals that as we work at our computers and lark then sleep in our cities, part of us craves leafiness and dappled light, and longs for someone to safeguard our green spaces, making Giono’s wry wise tale as much about human nature and hope as it is about trees. 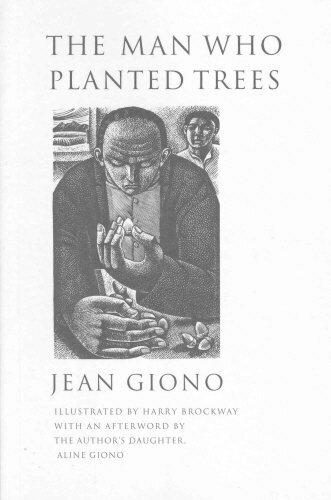 The Man Who Planted Trees by Jean Giono is published by The Harvill Press and is available to buy from Amazon. This entry was posted in Reviews and tagged Jean Giono, literary translation, The Man Who Planted Trees by Judy. Bookmark the permalink.